With March 4’s general election, the Five Star Movement (M5S) became Italy’s largest party, winning 32 percent of the vote. Yet its historic opposition to coalitions made it unclear whether it could govern. The breakthrough force on election day was Matteo Salvini’s Lega Nord, a hard-right party which rose from 4 to 17 percent. Cultural clashes between these parties as well as Salvini’s desire to lead a coalition of the Right seemed to hamper any deal. Some media outlets persist in calling the M5S a party of the “far left” or “alt-left.” In reality, despite its dominance among once-Communist aligned groups like the unemployed, blue-collar, and young voters, it is the fruit of the Left’s collapse. M5S does not speak the language of solidarity but expresses the outrage of the crisis-hit individual, unable to make her way in the world and openly scorned by aloof centrist parties. In the weeks since the election the M5S’s “anti-establishment” revolt provided a vacuum for other, hard-right forces to fill. M5S leader Luigi di Maio, who had once derided “NGO taxis” saving African migrants trying to cross the Mediterranean, reached a coalition deal with Matteo Salvini on May 18 that promised a massive crackdown. The contract called for the repatriation of five hundred thousand migrants, as well as reactionary measures like a flat tax gifting massive tax cuts to the wealthiest Italians. On Sunday night, the coalition prepared by M5S and the Lega collapsed as president Sergio Mattarella refused the Lega nominee for economy minister. The “outsiders” have been kept out of the corridors of power, for now at least. Yet the defeat of the old major parties is no less certain, and the big winner is Matteo Salvini. 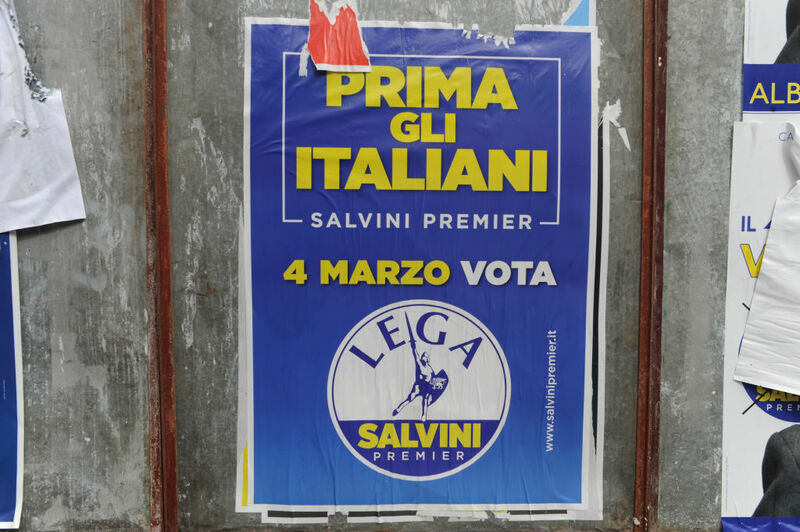 Not only has the Lega dominated the Right and imposed its stamp on the M5S, but attacks from Italian and EU institutions have massively strengthened Salvini’s hand. Mattarella has now asked former IMF official Carlo Cottarelli to form a caretaker administration until fresh elections are held. At present it is doubtful whether this government will even briefly achieve parliamentary support. But this supposedly neutral cabinet stands directly opposite to the government that seemed likely to take form just days ago. Its leader was an architect of austerity in Italy, and his centrist cabinet is set to be populated by unelected technocrats. Such a spectacle can only aid the right-wing forces today monopolizing the banner of sovereignty and democratic choice. Lega-backed economist Paolo Savona makes for an unlikely anti-establishment martyr. Twenty-five years ago, he was himself the trade minister in a technocratic cabinet, and a decade later he was Silvio Berlusconi’s man responsible for relations with the European Union. Yet the affair surrounding Savona’s nomination as economy minister has served Salvini’s aim of posing as a voice of the democratic majority, thwarted by president Sergio Mattarella and his European allies. Mattarella was long a member of the Christian Democratic party, before joining today’s Democrats, a centrist, neoliberal, and staunchly pro-European party. The Italian president is elected by parliamentarians rather than directly by citizens, and his role is to defend the constitution rather than act in a partisan fashion. Formally, it is the president who picks the cabinet, on the advice of the prime minister; in this sense Mattarella did act within his remit by rejecting the Lega’s nominee. Yet Mattarella’s decision looks like a political move — and not a very wise one. Extremely rarely, as in the case of a justice minister proposed by Silvio Berlusconi who had fallen under police investigation, does a president deviate from the prime minister’s choices. Mattarella’s framing of his decision in terms of market pressure and Italy’s commitment to the European Union did little to present his decision as a matter of upholding the democratic will. In truth, Savona’s past statements suggest a desire to break with the euro much stronger than the Lega-M5S contract implied. Both parties had removed the anti-euro content of their manifestos before the election; had they wanted, they could have proposed another figure for economy minister. Yet Mattarella was not just rejecting one unsuitable individual. If the president insisted that he could not allow pressure on Italians’ savings, the affair mainly played out as a question of Italy’s loyalty to the European Union. The Lega thus blended vague calls for EU reform with identitarian posturing. This has in turn helped marginalize Silvio Berlusconi’s Forza Italia, a now pro-European force. The Lega’s narrative of ordinary Italians being crushed by institutions and foreign powers clashes with the more free-market elements of its program. Indeed, it isn’t at odds with the European Union itself. Its government contract with the M5S even made a rhetorical embrace of the spirit of the European Union’s founding treaties, while calling for a Europe that takes responsibility for clearing out refugees. Yet despite the vagueness of Salvini’s calls for EU reform, harsh language in the German press calling Italians “aggressive beggars” who make tax evasion “a national sport” helped him to rally a nationalist consensus. A founder of the European Union and long one of the most federalist countries, today Italy is in fact increasingly Euroskeptic. Younger Italians hit hard by the 2008 crisis — GDP remains below pre-crisis levels — are particularly likely to take a negative view of the euro and the European Union, having seen big promises about the single currency followed by protracted austerity. One recent poll found 39 percent of Italian voters think EU membership a “good thing”: less than 47 percent figure the UK, which is already on its way out. Italy’s sky-high youth unemployment and lack of tools to deal with a near €2.4 trillion public debt aggravate discontent at the euro. Yet beyond this question the Lega has made headway whipping up racism and exploiting resentment at the squandering of public funds on Mafia-run detention centers. While the M5S and Lega only toyed with the idea of calling for a partial cancellation of the public debt — absent from the final coalition agreement — the calls for sharp anti-immigration measures, and Salvini’s own nomination as interior minister, went unchallenged. Savona and putative prime minister Giuseppe Conte, a minor law professor who had been almost totally unknown until one week previously, were in this sense just bit-part players in the Italian drama. The attempt to form a government and its subsequent collapse have been grist to the mill of reactionary forces. Despite the Lega’s incoherence on the euro, it has pushed sharp nationalist themes onto the agenda and provoked the clash with Brussels that Salvini desired. The president can invoke constitutional authority, but fresh elections seem likely to punish his move. Since the March 4 general election, centrists have adopted a besieged stance, complaining that their defeat owed to the politics of “social envy” against the rich. In the days after the vote the media critics of “populism” even confected a hoax about Southerners flooding unemployment offices in search of their promised benefits. This contrasted with near-silence on the reactionary effects of the M5S-Lega tax policy. Yet had Salvini’s flat tax program been implemented in full, a family on €300,000 a year would have saved €67,940; a family on €30,000, nothing. The likely black hole in public spending would have hit the M5S’s own poorer voters hardest. Seemingly the ultimate anti-establishment party, the M5S has been rather less emboldened than the Lega by the current constitutional crisis. On May 18, when leader Luigi di Maio asked the M5S’s registered supporters to vote on the government contract he had arranged with Salvini, there was a thumping 94 percent vote in favor of the deal (a 40 percent turnout, in a ballot lasting less than a day). This reflected both the M5S’s willingness to capitulate to the Lega’s reactionary politics, and the ease with which leaders can impose their will on atomized “supporters” by way of online referendums. The vote for this deal in fact came just sixteen months after the same electorate voted by 78.5 percent to join the liberal, Euro-federalist Alliance of Liberals and Democrats for Europe (ALDE) group in the EU parliament. That move soon ran aground. But in each case M5S leaders got what Italians call a “Bulgarian majority” — a mandate so emphatic, it can hardly be believed. The M5S is a party of media stars and fans rather than organizers and militants; when the leaders change the line, the passive membership simply follow suit. It was not meant to be like this. In the early days of the M5S, such was its hostility to the connections between mass media and the political establishment that anyone who appeared on TV rather than M5S’s own blogs and podcasts was expelled. Codes of conduct were drafted, binding its elected officials to hand over half their salaries and promising to kick out anyone faced with corruption inquiries. Coalitions with other parties were ruled out on principle. Yet the M5S has now abandoned all of these supposed defining principles. Worse, it became little but a prop for the far more coherent Lega. The M5S’s claims to stand above ideology make it constitutively slippery. The child of two decades of economic malaise and the collapse of the Left, the M5S arising in 2009 was bound to reflect the despair of our time. While it purports to stand for an apolitical common sense, it in fact expresses the particular common sense of an era in which atomized, crisis-hit individuals distrust public institutions and do not see collective action as a viable solution to their problems. Italy’s last two labor ministers each blamed youngsters for being too “choosy” about finding work: one suggested they may as well leave Italy. Such talk makes it easy to see why collapse for the center has fallen, and why the Democratic Party in office since 2013 no longer wins support among young and blue-collar voters. But the M5S reflects the decline of social solidarity rather than offering a way out of it. It has cleared out the old parties only to open the door to toxic and reactionary forces. Telling in this regard was a 2015 video circulated on social media in recent days, in which longtime M5S activist Alessandro di Battista promised to “dismantle the Lega in five minutes.” At that time sharply opposed to the Lega, he nonetheless begins the video by insisting “Let’s not go on attacking Salvini as a ‘racist.’ Let’s talk about the money.” The video derides the Lega as merely part of the political class, with its high salaries and expenses claims. Yet as his party abandoned its past stance against coalitions, in exchange for windy rhetoric on decency in public life, it predictably capitulated to Salvini’s agenda. The M5S had long spoken of a “citizens’ income,” only to arrive at a €780 a month benefit conditional on accepting job offers. There were no specific measures to deal with the age-old neglect of the South. The pact also promised immigration detention centers in every region, and radical tax cuts to dual 15 percent and 20 percent “flat” rates. The M5S had no solidarity with the victims of the Lega’s racism, because it does not believe in solidarity at all. Its MPs have consistently abstained, en bloc, on social issues like gay rights or immigration, that might otherwise divide its ranks. It rages against “head in the clouds” liberals with similar vigor to its attacks on wasteful public spending. It stands only for the “ordinary guy in the street” — as long as he’s a small businessman, and it probably helps if he’s not from any of those troubling minorities. The origins of the Lega are instructive in this regard. While hardly identical to the M5S’s trajectory, it is notable that the Lega made its first breakthrough in the 1992 election not as a hard-right party but as an anticorruption movement that sought greater autonomy for Northern Italy. Like the M5S formed in the late 2000s — a party with a much stronger Southern base — the Lega Nord’s initial advance under leader Umberto Bossi owed to the scandals that engulfed more established forces. Formed by regional autonomy movements that emerged over the 1980s, at the 1992 election the Lega made its first parliamentary breakthrough. It won eighty seats across the two houses, exploiting the “Bribesville” trials that buried the old Socialist and Christian Democratic parties after the dissolution of the Communist Party the previous year. It was widely labeled a qualunquista movement: one that spoke to the “ordinary guy in the street” as against “the parties,” but also giving vent to chauvinist sentiments. From the outset the Lega had strong Thatcherite elements. Its fury against Roma ladrona (the “thieving” capital with its taxes) and racism toward “lazy” Southerners and immigrants was combined with the call for a rationalizing “clean-up” of a bloated state. Its “liberalizing” vein even allowed Emma Bonino — today leader of the liberal, ultra-pro-EU More Europe party — to stand in alliance with it in the 1994 election, explaining that the Lega was “non-ideological.” In 1995-96 it joined with the center-left in backing a “government of experts” composed of unelected technocrats. In 1997, the Lega held a mock general election for Padania, the Northern super-region dreamt up by the separatists as a new country separate from Italy. A variety of political affiliations were represented, from the far-right Destra Padana to the so-called Padanian Communists, for which today’s leader Matteo Salvini stood. The glue, across these divides, was a shared contempt for the South. It was a measure of the Lega’s mounting influence that between four and six million ballots were cast in an election organized and carried out by the party itself. If in an early phase of its existence the Lega backed Lamberto Dini’s technocratic government, for much of the last two decades it has been allied to Silvio Berlusconi’s center-right. Nonetheless, events since the 2008 crisis have radicalized the Lega. This owes not only to grand coalitions drawing Berlusconi into pacts with the centrist Democrats, but also the opportunities offered by the wider fragmentation of the Italian political landscape and indeed the Lega’s own internal dramas. Key in this regard was the fall of Umberto Bossi, who had been the Lega’s founding leader in 1991. In a rather familiar tale for any observer of Italian politics, the man who had railed against “thieving Rome” himself came under investigation for fraudulent use of public funds in 2012, as well as using the Lega’s finances for his personal purposes. The Lega’s “president for life” Bossi was forced to resign; he and his sons each ultimately received jail sentences for fraud. The Lega entered into crisis. The convergence in M5S and Lega rhetoric was also a marker of their rivalry. For a Five Star leader who wanted to “deconstruct the Lega,” it thus made sense to ridicule a figure like Roberto Maroni, the Lega president of Lombardy who spent €5.9 million of public money on wages and expenses in two years. Yet M5S’s posture of not talking about issues like racism or gay rights, when the “real issue” was corruption, also helped ease its ultimate pact with the hard right. It is too easy to imagine the M5S as a distorted class revolt. In the general election it won 50 percent among the unemployed and is backed by four times more blue-collar workers than the Democrats. It scores poorly among older Italians, yet one survey showed that those who voted Communist in 1987 are today more likely to vote M5S than Democratic. This shows not just the displacement of the left-wing vote between parties, but a wider decline of class identity and belief in social solidarity. For an example of the M5S in action we need only look at its performance in charge of Rome city hall. The Mafia Capitale revelations about bribery under recent administrations, followed by a farcical expenses scandal engulfing the previous Democratic mayor, helped speed the M5S’s Virginia Raggi to office in 2016. In the runoff against the Democrats only the wealthiest districts were not colored M5S yellow. Yet her record has hardly been based on service to the poorest Romans. Under her watch Rome’s already chaotic public transport and waste services have sunk even further, occasioning strikes by bus passengers as well as drivers. A corruption scandal involving Raggi, in which she was ultimately absolved, so endangered her that M5S had to abandon its internal honesty charter which promised to sack officials who came under police investigation. As negotiations for the new government were ongoing this week, Raggi’s office was besieged by protesters opposed to the closing of the International Women’s House, a key feminist space in the city. For the mayor’s M5S colleague Gemma Guerrini, there could be no justification offering state funds to a project that had “failed to boost entrepreneurship” — as if making money were the only merit of a women’s center. Former comedian and M5S founder Beppe Grillo had in recent months repeatedly ruled out any deal with the Lega. Di Battista insisted in his 2015 video that beyond its racism, the hard-right party was just the same as the thieving politicians of all other colors. But not only the M5S leaders are fickle and hypocritical, but its supporters themselves. In the wake of the general election, its web forums were a wall of admiration for Di Maio, whether he was seeking a deal with the hated Democrats or with the Lega. But it was clearly the Lega and not the M5S that imposed itself on the putative coalition. The M5S’s choice of a non-descript premier, coupled with its lame insistence that it had not made a coalition with the Lega (only a “government contract”) reflected its attempt somehow to keep its hands clean even as it lifted Salvini to power. Some declare the new era a Third Republic, as the parties of the 1990s and 2000s have been swept aside. Yet the M5S is less the pillar of a new order as the vacuum left by the old. Amid the collapse of the old center-left and center-right, the hard right looks to be the main beneficiary of the snap elections due some time later this year. While in the general election the M5S was the leading force in most regions, the Lega is today advancing outside its heartlands to become an all-Italian nationalist movement. Its rise in national polls since March 4 (rising from 17 percent to 25 percent, mainly at the expense of Berlusconi’s party) has been borne out in recent regional contests. In Molise, a southern region where the Lega had never stood before, the April 22 vote saw the party jump to 8 percent. In Val d’Aosta (a northwestern region with its own French-speaking autonomists, where the Lega did not present candidates in 2013), last weekend’s contest saw Salvini’s party hit 17 percent, winning representation for the first time in over two decades. Not only has the Lega increasingly imposed its leadership over its right-wing allies, but it also seems to be winning voters from M5S. In Val d’Aosta the M5S replaced its anticorruption posters with ones focused on local autonomy, aping its hard-right partner and rival. If a certain left-wing optimism holds that the M5S’s pact with the Lega will reveal its true reactionary nature, and thus help revive more progressive forces, little about the current scenario suggests it is about to collapse. Millions of former left-wing voters do indeed vote M5S; many of those, like sociologist Domenico de Masi, who painted it as a “new Communist Party,” have been forced to backtrack or eat their words. Yet if anything it is the Lega that continues to build its support, filling the vacuum of authority with its own agenda. Some still speak of “the people of the Left,” as if there were a static bloc of left-wing opinion displaced between different parties. This almost identitarian conception of being left-wing has strong roots in an Italy with a record of sharp social conflict and a Communist Party that was both mighty and marginalized, what Pier Paolo Pasolini called a “country within a country.” Yet such a “people of the Left” does not simply go on existing even when it lacks visibility and cohesion. The support for the M5S among the young and unemployed shows not that this party is left-wing, or ever was, but rather that it has exploited the collapse of the Left’s bases of support. It expresses the consciousness of the individual who has grown up in times of constant economic malaise, in which collective action is ever-more difficult and politicians calling themselves left-wing openly deride the young as lazy and at fault for their own problems. Italy is a country in which class politics is increasingly invisible and all that differentiates the dominant parties is the greater or lesser chauvinist bent to their free-marketeer policies. At the very moment he looked set to become interior minister, Salvini could proclaim the struggle is no longer “right versus left but people against elites.” That is how he will frame the next election. The rise of a new “caretaker” government looks set to help this most reactionary figure pretend he is not himself the new elite.